I remember cooking omelets in teflon pans in high school and thinking how easily they came out of the pan despite the lack of fat in the bottom of the pan. Fast forward to my second year of marriage and you can see me at the sink desperately scraping the shellacked egg from my stainless steel pan. Sure I was burning calories, but I think I’d rather be running around with my toddler instead. One day shortly thereafter my husband came home with one of the most romantic gifts a girl like me can think of – a cast-iron skillet. That was shortly followed by another, larger, cast-iron skillet and I couldn’t have been happier if he had hand-picked a field of wild roses just for me. But, my egg cooking still often involved me scraping the bottom of the pan in a desperate plea to remove that shellacked protein while maintaining the shiny seasoning I thought I had. It’s been about six years now and approximately 18,000 eggs have been cooked in these skillets. (Yikes!) 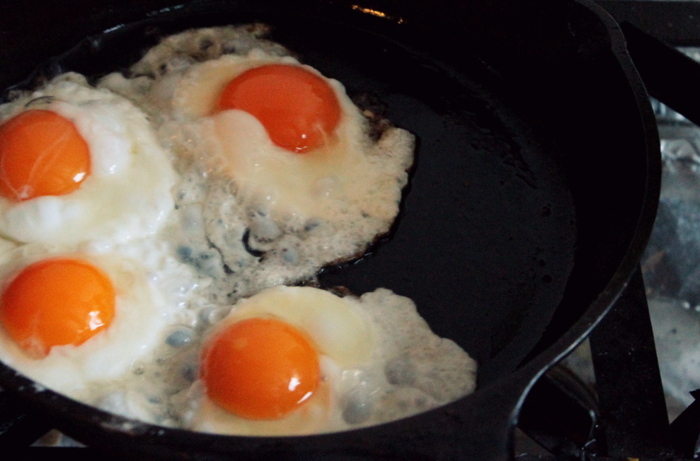 Just this morning I served up fried eggs with nary an albumen stuck to the pan. Before I jump into the tips I should say that I find that eggs stick more frequently when things like bacon or potatoes are cooked in the skillet prior to cooking eggs. They are a whole different ballgame, so these tips are just for cooking plain eggs. First, seasoning. There are a host of theories on the internet that you can follow. I’ve talked before about how I care for my cast-iron, which includes my seasoning regimen. It really does make a huge difference to keep it well seasoned which includes frying foods in coconut oil or lard for us from time-to-time. Second, heat. I used to blast my eggs into oblivion because I had read somewhere that a hot pan will not let eggs stick. This, of course, results in overcooked, dried out eggs which no one really likes. So, I used the properties of cast-iron to my advantage. Cast-iron takes a long time to heat up but retains heat incredibly well. So instead of putting my skillet over high heat, I put it over medium-low heat and then let it heat up for a few minutes before adding fat. Third, fat. I don’t like to tell people what to do but you should cook your eggs in fat. Butter, lard, or coconut oil; it doesn’t matter. Just make sure you’re using plenty of it. 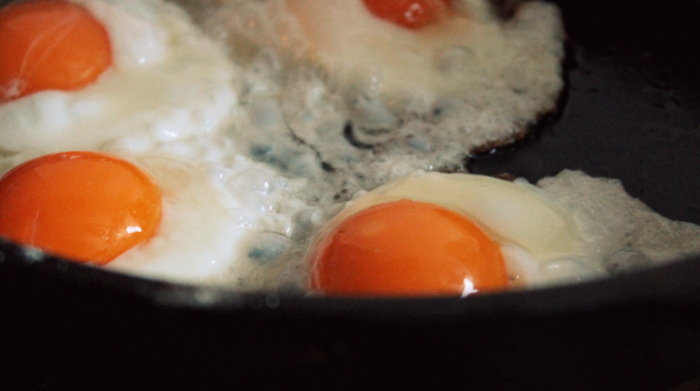 In my 10″ skillet I usually add 2-4 Tablespoons of fat for every session of egg-cooking I perform. Fourth, patience. If there’s one thing that will make things stick to your pan it’s trying to turn them before they’re ready. When fried eggs you want to be sure and let the underside set before attempting to flip. For scrambled eggs you want to let them set in the bottom of the pan for just a couple of minutes, then gently stir them around periodically. Whether fried or scrambled, be sure to turn the pan off before your eggs are completely cooked since the cast-iron holds heat and will continue to cook them. Fifth, removal. This is pretty straightforward unless you’re using a crazy sharp utensil. You want to try not to scrape the bottom of the pan with a knife or super-sharp object. Finally, if your eggs do happen to stick – and they may from time to time, depending on seasoning and proper cooking – you can follow my pan-cleaning routine here.